Born and raised in the Bronx, N.Y., Vanderberg has spent his entire career studying the tiny, mosquito-borne malaria parasites that kill about one million infants, mostly African, every year and make another 500 million people severely ill. Although malaria is largely treatable, the necessary medical care is often unavailable in the poor countries where the disease rages. To make matters worse, the parasite is constantly mutating, outmaneuvering even our most powerful medicines. Video: Inside the lab, NYU researchers hunt for an effective malaria vaccine. “Drugs are really not the answer because the parasites develop resistance very, very quickly,” Vanderberg says, sitting comfortably reclined in his dowdy brown and beige office at New York University’s School of Medicine. A lean, grizzled professor of medical parasitology, he seems vigorous despite his 74 years and droopy eyelids. There has been talk of retirement, he says, but he is reluctant to leave. With good reason. After a long hiatus, the vaccine concept he and his colleagues came up with more than three decades ago — stunningly powerful but exasperatingly unwieldy — is now resurfacing after a drastic facelift by retired U.S. Navy Capt. Dr. Stephen Hoffman. By preventing people from getting sick in the first place, an effective vaccine would provide a much more permanent solution to malaria than any drug. It would also help stem transmission of the disease on a larger scale, because the parasites depend on human hosts for reproduction. But malaria has proved a tough case: After decades of painstaking research, the first malaria vaccine has yet to hit the market. What is more, the one farthest along in the pharmaceutical pipeline offers only about 50 percent protection. Vanderberg is the first to admit that his original idea was far-out: He wanted to use mosquitoes as live syringes, injecting a crippled version of the malaria parasite that was unable to cause a full-blown infection, but would still provoke the immune system to make antibodies against the real thing. Weakened live viruses or bacteria are commonly used in other types of vaccines — such as those for polio, measles or typhoid fever — but the malaria parasite is simply too big and unsafe to be injected directly into the blood, where it could trigger infections or choke vital blood vessels. A mosquito bite, however, is harmless. When mosquitoes bite, they first inject a little saliva to keep the blood from clotting while they imbibe it through their needle-like proboscis. 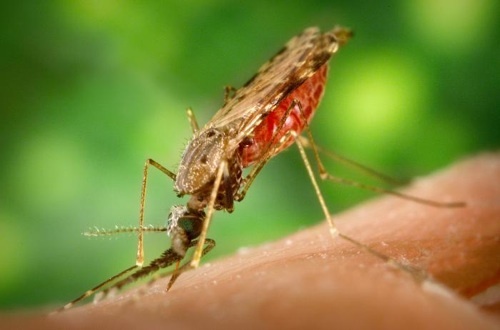 The malaria parasites, known as sporozoites, enter the skin through the saliva. Once inside the body, the microscopic stowaways have an uncanny ability to glide straight through our cells, entering the blood stream and traveling to the liver where they camp out and multiply. After a week or so they gush out into the blood again, answering some biochemical call of the wild, and invade the red blood cells. This is when you know you have malaria. As the parasites multiply ferociously inside the red blood cells, they end up bursting them. The cycle repeats itself, destroying the blood and causing waves of high fever. As if it weren’t enough, the parasites also make the red blood cells sticky. Like wool on Velcro, the cells cling to the small blood vessels, snagging them and preventing oxygen from reaching the tissue. In the brain, this can cause coma and death within a day. To destroy the parasites’ ability to multiply in the human liver, Vanderberg and his colleagues x-rayed a batch of infected mosquitoes. The team then let the bloodsuckers feed on the forearms of three prisoners on several occasions. After that, they paired up the mosquito-immunized men with controls who had never been bitten. Then they brought in the heavy artillery: mosquitoes chock-full of feisty parasites that had not been x-rayed. Within days of being bitten by the unirradiated insects, all of the controls came down with malaria as expected — and so did two of the immunized men. The scientists reasoned that the initial dose of weakened parasites had been too low for them to be protected. But the third prisoner, a 37-year-old man called G.Z., was unharmed. With red and swollen forearms, the dining table of more than 2,000 x-rayed mosquitoes, G.Z. had become immune to the disease. Appearing in 1973 in The American Journal of the Medical Sciences, the finding went down in history as the first successful human vaccination against malaria.